Ambrose Ali University (AAU), Ekpoma Acceptance Fee Amount, Payment Guidelines for Freshers/Newly Admitted Students for 2018/2019 Academic Session. 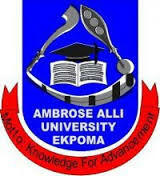 Authorities of the Ambrose Alli University (AAU), Ekpoma has published the acceptance fee amount and payment procedure for all the candidates offered admission into the university DEGREE programmes for the 2018/2019 academic session. SEE ALSO: Ambrose Alli University Admission List 2018/2019.